Potentials of virtual environment for enhancing creativity of architects have shaped this research. There is no singular definition of creativity. In fact, there are more than 100 different definitions for creativity according to different contexts and disciplines. Nevertheless, it is possible to confine the boundaries of definitions and address creativity within a confined framework. The first practical step was thus to perform an in-depth literature survey to define a boundary condition for the widespread topic of “creativity” and identify vital research questions pertaining to creativity. In this regard, personality and behavior of creative people; mood, state, temper, intelligence vs. creativity, motivation and so forth were ignored. Instead, cognitive aspects of creativity such as thinking patterns, conceptual blending, idea expansion and tolerance of ambiguity have been focused upon. The third step, involved the introduction of unconventional virtual environments (UVEs), which subsequently lead to the creation of a hypothesis. This hypothesis tries to connect navigation in UVEs with the enhancement of creativity. Characteristics of UVEs and theoretical arguments around the hypothesis were also discussed. 1- Tolerance of ambiguity has a direct relationship with creativity. Architects deal with multiple parameters during a typical design process. The ability to meaningfully process the relationships between such a multitude of parameters has also trained architects to possess a higher level of tolerance of ambiguity aiding them in postponing making hasty judgements. 2- By combining different ideas, one can formulate newer and much novel ideas. Ideas tend to become creative when more remote ideas are combined and synthesized. In order to prevent repetitive and self-similar ideas, the unconscious mind needs to be fed with more ideas, which the mind has not been exposed to. These new ideas/experiences can be generated by exposing one’s self to UVEs, since UVEs can expose one to situations and experiences which the brain cannot experience in the physical world. The fifth step, aims at understanding how the brain perceives different environments. Three different environments were chosen for an experimental study pertaining to the same: 1- Abstract environment 2- Semi-designed environment and 3- Fully designed environment. Participants were asked to provide a feedback by answering a questionnaire after navigating each of these environments. Simultaneously, their brain activity patterns were recorded via a professional neuropsychology apparatus. After analyzing the brain activities, in conjunction with the questionnaire, it became clear that perception of an abstract environment is completely different from the perception of a Semi-designed or Fully designed environment. This experiment consolidated the hypothesis that UVEs as abstract designed environments activate parts of the brain that are correlate with creativity. The sixth step, involved putting the hypothesis to a final test. A conclusive experiment was thus designed. The experiment won the Visionair fund of FP7 and was conducted in Italy. A UVE was designed using the software 3D max and was converted to 3D stereoscopic mode using a specific software: GIOVE; developed in ITIA-CNR, Italy. Using a 3D goggle and 6 axis mouse, a group of 20 participants were asked to navigate the UVE. They were asked to provide a written feedback pertaining to their feelings, expectations, strategy of navigation and in general, their experience. Their responses were collected and analyzed. The final step, involved answering the formulated research questions and discussing the final results. Creative potential of human spearheads their civilization. In fact, progress in every sphere of our lives crucially depends on our creativity. Emphasizing the role of creativity in design even more than other disciplines pushes one to explore understanding of creativity as a key role player in Architecture. Furthermore, by identifying the basic principles of our ingenuity/creativity, researchers might be able to enhance these abilities in the future. But how can we define creativity? Though creativity is the hallmark of human cognition, and therefore a topic of enormous scientific importance, yet not a single definition of creativity exists that is universally accepted by creativity researchers, and the scenario hasn’t changed much in the last fifty years. Nevertheless, any creative output (be it an idea, product, or performance) should have, at least, three characteristics: novelty (it is original), usefulness (it is functional and adaptive), and surprising (it is non-obvious, therefore eliciting an aesthetical or affective response). Many architects confess that, very gradually and unconsciously they tend to inherit and hold on to conventional design approaches, because slowly confinements in construction and conventional stereotypes impose on them, dominate them and prevent them to think innovatively. Now, it is seemingly logical that if you get a chance to see and explore some innovative notions in virtual environments, devoid of any physical limitation, then it will lead to conceptual expansion, since diverse pictures/ inspirations shall be added to pre-conceived design ideas. This will help designers to expand their conceptual boundaries and thus eventually help them to enhance their creativity. Being in varied or miscellaneous environments can help train individuals to encode information in multiple ways, building a myriad of associations between diverse concepts. A pivotal target of this thesis is ‘how to enhance creativity’. 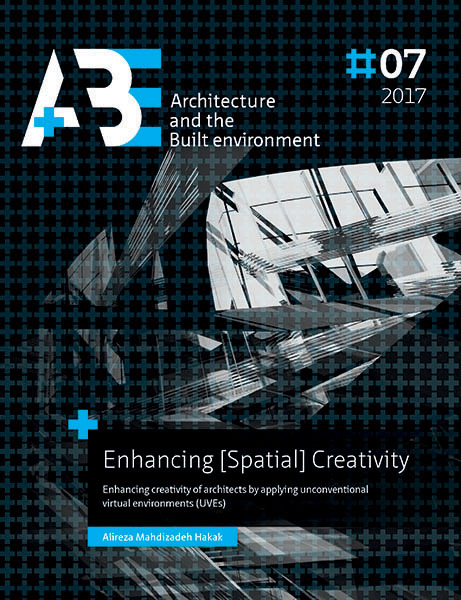 This chapter reviews effective parameters correlated with creativity in architectural design. The Chapter starts with the definition of creativity and investigates where creative ideas come from. Further on, it also elaborates upon types of creativity and touches upon the relationship between tolerance of ambiguity and creativity. To narrow down the widespread topic of creativity and focus on creativity in architecture, the research ignores aspects of creativity which focus on personality and behavior of creative people, their mood, their state and their temper, intelligence vs. creativity, motivation and so forth. Instead, the research focuses on cognitive aspects such as thinking patterns, conceptual blending, idea expansion and tolerance of ambiguity. These aspects are elaborated in the first journal article: “Creativity in architecture -A review on effective parameters correlated with creativity in architectural design” in the Journal of civil engineering and architecture, ISSN 1934-7359, USA, Nov. 2014, Volume 8, No. 11 (Serial No. 84), pp. 1371-1379. One of the main targets of this research is to find methods and tools for enhancing creativity. This chapter compares the results of an experiment focusing on the starting phase of a design process from two different dimensions: analogue 2D vs. digital 3D. The experiment involves providing the same design task to a group of students using two different starting points: first, with a lower dimension of analogue 2D (pen and paper) and the next time with a higher dimension using 3D software. Students, in their last semester of Bachelor’s, who were quite familiar with architecture and design were used as test subjects. A group of architecture experts were assigned as jurors, who subjectively judged whether the creative performance of the students had been enhanced after experimenting with the higher dimension 3d environment. This chapter introduces unconventional virtual environments (UVEs) in the context of this research. The characteristics, types and parameters of UVEs are defined. Moreover, the role of experience and its efficacy on idea expansion and divergent thinking are also discussed in this Chapter. The brain possesses existing knowledge of architectural space, styles and physical world. By exposure to UVE, previously unknown data feed can be added to this existing knowledgebase. The brain tries to digest this new feed by connecting them to the previous/existing knowledge of space. It is hypothesized that the challenge of the brain to digest new feeds, indirectly stimulate creativity. To prove this hypothesis, more research experiments were designed. These, are discussed in the following chapters. After examining the hypothesis, a possible implementation of UVEs within architectural pedagogy is also discussed. It is also suggested to provide workshops for developing UVEs and let students navigate and interact with them during their education in order to expand their inventory of experiences. The more they can expand their experiences, the more combination of ideas is made possible, which, will indirectly influence their creativity. Respective research findings have been published in the third journal article: “Implementing unconventional virtual environments for enhancing creativity in Architecture pedagogy”, IGI Global Publisher, Volume 3, Issue 4, 2012, pp. 41-52. The experiments firstly aim to identify the relationship between conceptual blending and navigating UVEs and secondly aim to identify the importance of tolerances of ambiguity in the discipline of architecture and engineering. The empirical evidences are published in the fourth journal article: “The Proto-Fuse project: methods to boost creativity for architects”, International Journal of Design Creativity and Innovation, Taylor & Francis publisher, pp. 1-16.